Oral Rehydration Salts (ORS) are a "must have" for marathoners, ultra runners, and all endurance athletes, including multi-stage athletes. ORS contain important electrolytes, in a base of dextrose, to enhance the body's ability to quickly absorb fluids during exercise. For Training and Racing: ORS is the perfect electrolyte replacement drink to prevent dehydration, hyponatremia, exertional heat illness (nausea, vomiting, prostration), and muscle cramping, while exercising in hot or humid weather. ORS are conveniently packaged to carry in your water belt to be consumed during exercise, as needed. ORS may be mixed with water, juices or other hypotonic beverages. ORS supply all the electrolytes you need for training and racing and additional electrolyte supplements are not necessary. For Recovery: ORS is the perfect combination of elements to replace fluids and electrolytes lost during heavy exercise and to hasten recovery. ORS is actually a substitute for an IV, when IV's aren't available. One packet of ORS makes 1-fluid liter that may be mixed as a recovery drink for endurance athletes experiencing dehydration, heat exhaustion and cramping. ORS are not banned from races that ban IVs, since ORS is taken orally as a drink, and ORS does not contain any banned substances. Potassium is an extremely important electrolyte that functions in the maintenance of water balance and distribution, acid-base balance, muscle and nerve cell function, heart function, kidney and adrenal function. In addition to functioning as an electrolyte, potassium is essential for conversion of blood sugar into glycogen, the storage form of blood sugar in the muscles and liver. A potassium shortage results in lower levels of stored glycogen. Because exercising muscles use glycogen for energy, a potassium deficiency produces great fatigue and muscle weakness, the first signs of potassium deficiency. The average athlete loses approximately 150 mg of Potassium in each liter of sweat (c). Dextrose anhydrous is the purest form of dextrose, commonly called glucose. It is manufactured by refining dextrose monohydrate, itself a pure form of dextrose. Dextrose anhydrous provides instant energy. It is the primary ingredient in oral rehydration salts (ORS). Dextrose anhydrous is used in intravenous (IV) fluids to provide nutrients to patients under intensive care who are unable to receive them by the oral route. Dextrose anhydrous complements the function of saline solution for a total electrolyte-energy balance. Trisodium citrate dihydrate is a tribasic salt of citric acid. It is produced by complete neutralization of citric acid with high purity sodium source and subsequent crystallization. Trisodium citrate dihydrate is widely used in foods, beverages and various technical applications mainly as buffering, sequestering or emulsifying agent. ORS belongs in every person's medicine cabinet. ORS is also valuable in replacing fluids and electrolytes lost during diarrhea and vomiting and is therapeutic fluid replacement for patients on chemotherapy. ORS is safe to give to infants and children experiencing vomiting and/or diarrhea, per instructions on the label. Add 1/4 of the contents of one package of ORS to a 20oz water bottle. Shake until all the powder is dissolved. Consume as needed during exercise. Calculate your Sweat Rate during exercise (b) and supplement with water, as needed, to replace overall fluid losses. Add the entire contents of one powder packet to enough drinking water to make one quart (32 ounces) or liter of solution. Shake the container until all the powder is dissolved. Drink one liter ORS over four hours. Do not add more water to the solution after it is mixed. Do not boil the solution. Make and use a fresh solution each day. To replace fluids lost from diarrhea. Follow package instructions. "I've been doing ultras since 1990. I used ORS during the 2007, 2008 and 2009 Badwater 135-Mile Ultramarathon, through Death Valley, during the hottest time of the year. I trained with ORS and knew it helped my body maintain a needed balance. During my Death Valley runs, I drank ORS regularly. I didn't dehydrate and I finished feeling better than I would have expected. I also drank ORS for recovery after my races. The true "end" result was that my physical well being after the races enabled me to summit Mt. Whitney… and then run back to the start at Badwater… 292 miles! I know there are many factors that lead to a successful race - especially something like Badwater. But I can't discount the benefits of ORS and the positive results I have had since I started using it three years ago." "In 2003, while training in Death Valley for the Badwater 135-Mile Ultramarathon, all of my training runs ended with nausea, vomiting, and severe heat cramps. A friend recommended that I try ORS, the same formula she had taken to relieve symptoms during chemotherapy for breast cancer. From the time I used my first packet of ORS, I never experienced any further problems. I went on to finish the Badwater Ultramarathon that year, in temperatures of 130, drinking 1-liter ORS every 4-hours, and did not experience any nausea, vomiting or heat cramps. I attribute my consumption of ORS during the race for my well being in the heat and to feeling the very best I have ever felt at the end of any of my 100-milers. "Oral Rehydration Salts are the panacea at the Badwater medical HQ. (Thanks to Nancy Shura who introduced them to us in 2004.) The runners LOVE the stuff. I can't recall one runner who couldn't tolerate it. We rarely give IV's at the race, as most runners seem to tolerate this oral rehydration quite well. It is amazing to see the runners come back alive after one or two of these packets, make a full recovery and go on to finish the race." This site is not designed to and does not provide medical advice, professional diagnosis, opinion, treatment or services to you or to any other individual. Through this site and linkages to other sites, Trail Run Events provides general information for educational purposes only. The information provided in this site, or through linkages to other sites, is not a substitute for medical or professional care, and you should not use the information in place of a visit, call consultation or the advice of your physician or other healthcare provider. Trail Run Events is not liable or responsible for any advice, course of treatment, diagnosis or any other information, services or product you obtain through this site. Trail Run Events is not liable for any direct or indirect claim, loss or damage resulting from use of this web site and/or any web site(s) linked to/from it. 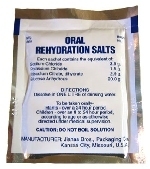 You are advised to consult your physician before using Oral Rehydration Salts in your training or racing. (b) How to Calculate Your Sweat Rate It is important to calculate the amount of fluid you lose during each hour of exercise, under usual conditions. This will serve as a guide to help you meet your fluids needs while exercising. your weight, in ounces (1 lb = 16 oz). record your weight, in ounces. exercise, in ounces (1 cup = 8 oz). amount of fluid lost during exercise. Example: Based on Running For One Hour. 2640 oz  (1) John's pre run weight  (165 lbs). 2624 oz  (2) John's post run weight (164 lbs). +           10 oz  (4) Amount of fluid John drank during exercise. Example: Based on Running For Four Hours. -         2576 oz  (2) John's post run weight (161 lbs). +           40 oz  (4) Amount of fluid John drank during exercise. (c) Amounts of electrolytes lost per hour during exercise varies depending on many factors, including but not limited to: climate (heat and humidity); athletic conditioning of the individual; degree of heat acclamation; absence or presence of vomiting or diarrhea; medications.